Appointments can be booked/cancelled in person, by telephone or online (via patient access). You can book appointments for the same day or up to 4 weeks in advance. Although it cannot be guaranteed, you will normally be given an appointment within 24 hours. Urgent cases are usually seen during the same surgery (the urgency of the case will be assessed by the doctor speaking with the patient). Where possible, we will try to arrange an appointment with a preferred doctor but please acknowledge that some of our GP's have other commitments including management of the practice, teaching and development of local health authorities. This may affect their clinic times, so please familiarise yourself with two or three of our GP's. If you would like a chaperone during your consultation, please ask at reception or during your consultation with the doctor. Appointment slots are 10 minutes so please remember that if you have several problems, you may need more than one appointment. If you wish to speak to a doctor on the telephone, a doctor will be available to speak to you Monday – Friday, between 12:00 – 13:00. You can make an appointment for this by contacting reception. If you no longer need an appointment, kindly cancel it. We provide one of the best access levels in our area but we can only continue to provide this service if people cancel unwanted appointments. Acknowledge that Monday surgeries are busier and the demand for appointments is higher. Be prepared to be flexible about which doctor you see. Whilst we encourage our patients to come to the surgery, where we have the proper equipment and facilities available, we do appreciate this is not always possible. In this respect, if you do need a home visit, you can help us by calling reception Ideally before 10:00am. Home visits are normally made between 12:00 and 15:00. You may only request a home visit if you are housebound or are too ill to visit the practice. Your GP will only visit you at home if they think that your medical condition requires it and will also decide how urgently a visit is needed. Please bear this in mind and be prepared to provide suitable details to enable the doctor to schedule house calls. We can no longer facilitate home visit requests made after 11.00am. Castle Meadows Surgery is an approved training practice. This may mean that you may see a GP Registrar (who is a doctor who has completed hospital training and is entering general practice). We also have medical students at the practice. These students are training to be doctors and are in their fifth and final year at the University of Birmingham. If you are happy to see a medical student we will ask you to read and sign a consent form first which explains that your consultation will be supervised by a doctor. What are the advantages to seeing a Medical Student I hear you ask? You get more time: Because they are in training, appointments with the medical student are 20 minutes as opposed to 10 minutes. As a result, most patients feel less rushed and more able to express their concerns without the regular time constraints felt in a doctor’s office. You get two sets of eyes: Because they are working under the guidance of Dr Rathore/Dr Field, not only do you get the medical student, but you also get to speak with one of the doctors too. You’re getting the most up-to-date care: Medical students are preparing for the completion of their degree. They are regularly attending seminars and have the latest medical information. You can help shape a new doctor’s career: The best learning doesn’t come from books but from patients. By allowing students to participate in your care, you are helping them develop their interpersonal skills and medical intelligence to carry through to the remainder of their career. Patient Access lets you use the online services at the GP. These include arranging appointments, repeat medication, medical record access and updating your details. Once you have registered you will only be able to book one appointment. To fix this the surgery will need to activate your full account. See below for more details. If you just want to use online access to book appointments and order repeat prescriptions, you just need to bring one item of photographic ID (such as a driving licence or passport) in to the surgery. We will activate your account and email you the access codes you need. For this we need to see two forms of ID; one must have a photograph and one must contain your current address. If you're not sure what you could bring for this, please call us on 01384 234737 and we'll help you out. Got an appointment with a doctor or nurse coming up? If you have, the clinician you see will be able to verify your identity without needing you to bring any ID - whatever level of access you want. 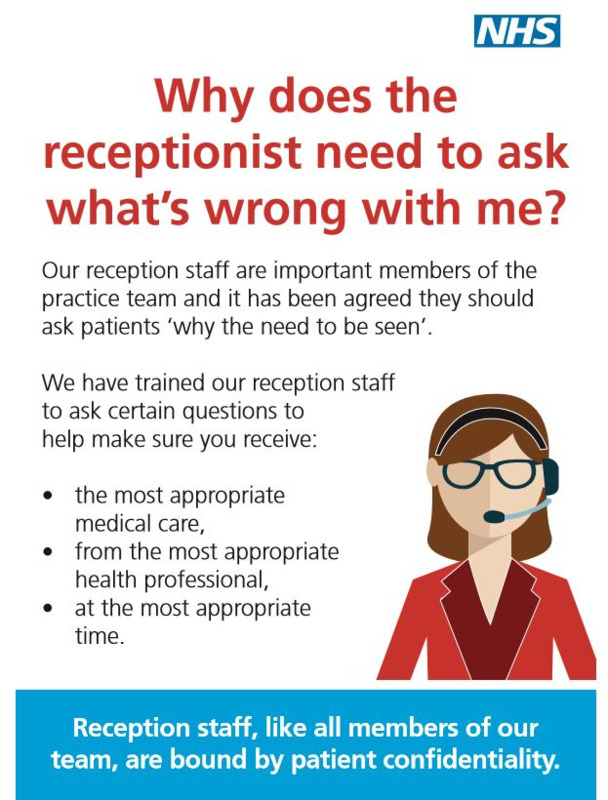 If you have any questions or quires please feel free to come into the surgery or call us asking to speak to patient services. Sedgley, Coseley and Gornal locality are now providing extended hours appointments for other patients registered at Castlemeadows Surgery. These appointments take place at Northway Surgery, Ridgeway Surgery, Woodsetton Medical Practice and Coseley Medical Practice. Although GPs from Castlemeadows Surgery will not be available for these appointments, you will be seeing GPs who will be able to access your full medical records at Castlemeadows Surgery and provide you with appropriate clinical care at times when Castlemeadows Surgery is closed. Please note these extended hours appointments can only be booked through Castlemeadows Surgery. You can book appointments in advance at a time that may be convenient to you and when Castlemeadows Surgery would normally be closed.